Genetic genealogy is relatively new. Basically, you send in a sample (cheek swab or saliva in a test kit) to a company, they sequence your DNA, and they then compare similarities in your DNA to others who have taken the test. They then give you potential matches with a predicted relationship based on shared DNA. 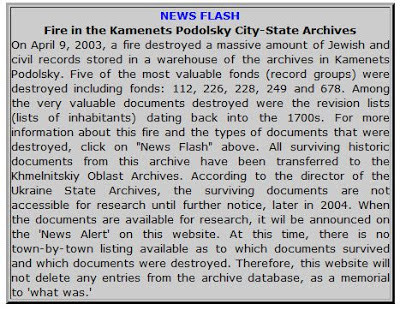 Genetic genealogy with Ashkenazic Jews is known to be...interesting. And frustrating. Because Jews married within the Jewish community with little outside DNA being introduced, we're not a very genetically diverse community--we are what is called an endogamous population. On the genetic genealogy front, this means that closeness of relationships is amplified. In the general population, if someone is predicted to be your fourth cousin, they're probably your fourth cousin--or maybe your third or fifth. 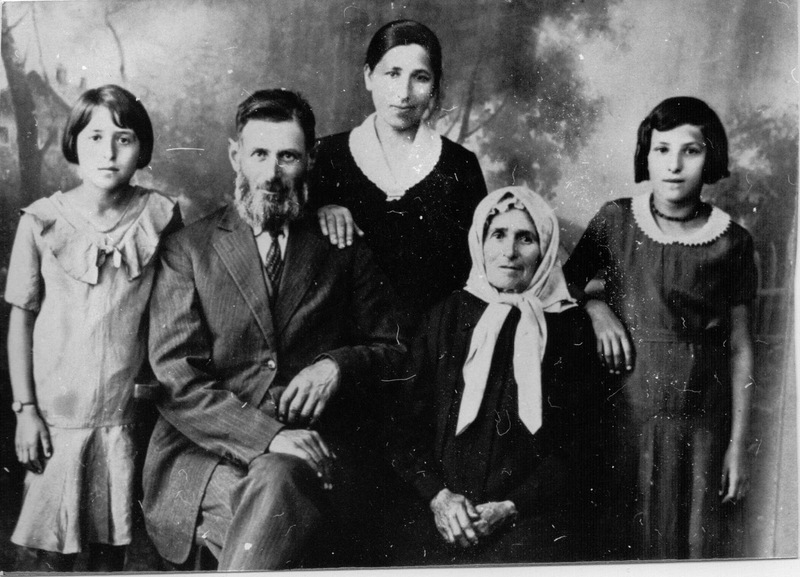 In the Jewish community, you're probably related multiple ways, so you will share a surprising amount of DNA. Your predicted fourth cousin may be a tenth cousin (and an eleventh cousin 3 different ways). My parents are predicted to be fourth cousins, but I have documented their families on paper living quite far apart at least back to the early 1800s. But in some way, I'm my own cousin. So anyways, I have a ton of predicted third and fourth cousins. And in general, I haven't managed to figure out the connection to most of them, since they're likely much further removed. I was able to verify known relationships when known cousins have tested. I also showed that I was not a princess switched at birth, since I genetically match close relatives on both my parents' sides. 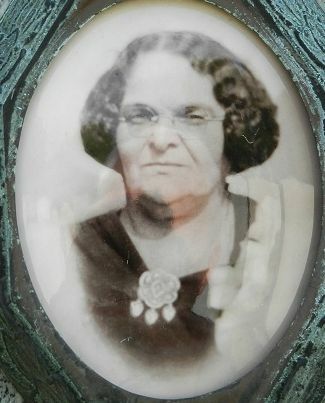 But then a prospective second cousin match popped up on familytreedna. The match's name was completely unfamiliar to me. I have a stock message that I send to the closer DNA matches with my family names and the towns that they lived in, so I send them to this guy Dave, asking if he saw a connection. He quickly responded that his great grandmother's maiden name was Jenny Diamond. So where was Isadore on the manifest? I reviewed everything I had on him and ran some more searches. 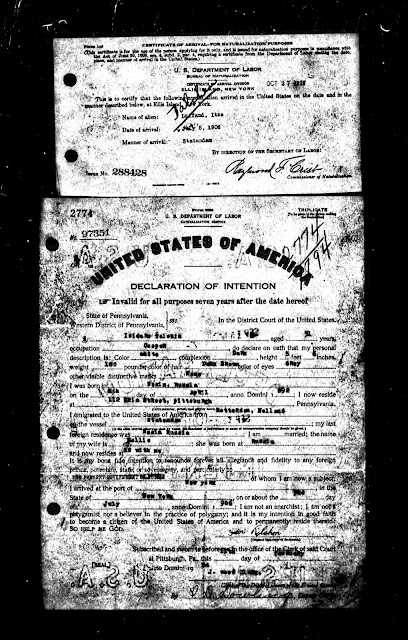 Ancestry had his naturalization papers (to which I hadn't paid a ton of attention since I had the version from the archives which was way more clear). But this version also had an extra card on top. Isadore Tolchin Declaration of Intention--with a bonus feature on top! 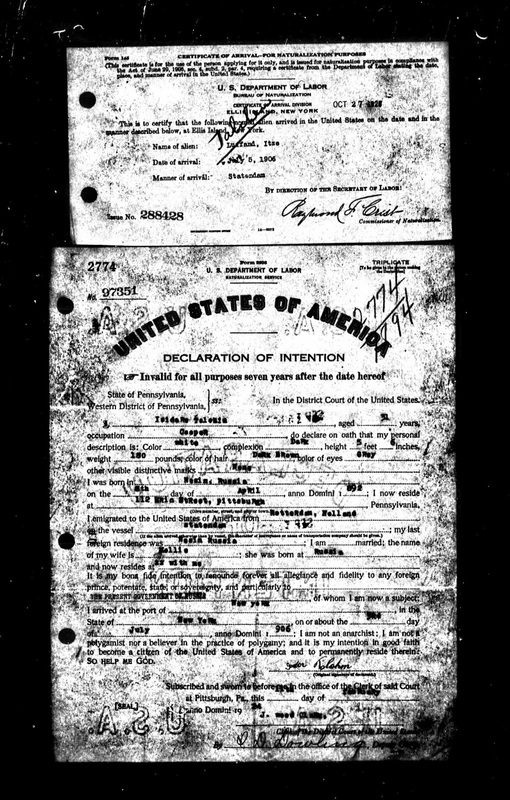 This card is often seen and is the record of the authorities checking that the immigrant actually came to the US on the date they stated. 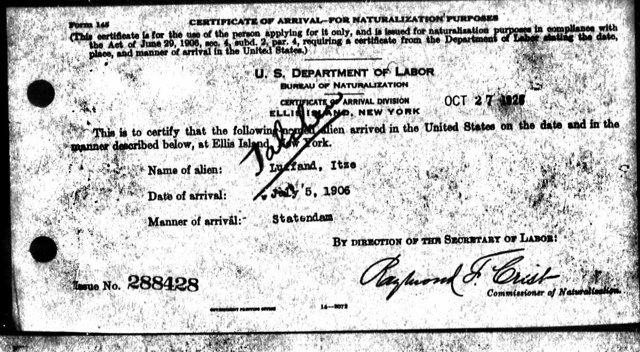 But while this one had "Talchin" hand-written over it and had a boat name and date that matched Isadore's naturalization papers, what was with the name? Tolchinskys from Shpikov? Tulchin? Nope! My grandfather Lou Tolchin always thought his father was from Shpikov, a small town south of Vinnytsia in what is modern-day Ukraine, in the Podolia region. 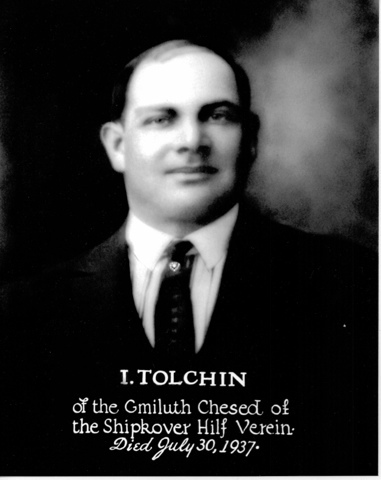 After all, his father Isadore Tolchin (formerly Yitzchak Tolchinsky) was an active member of Pittsburgh's Shpikov Society. 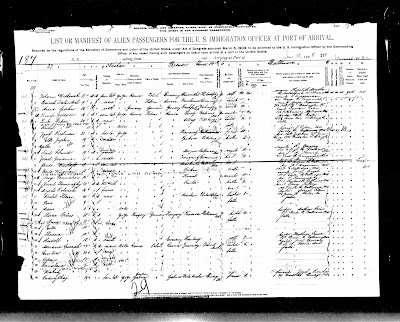 But when I found his father Hillel's naturalization papers, it said that his birthplace was "Luben, Russia." 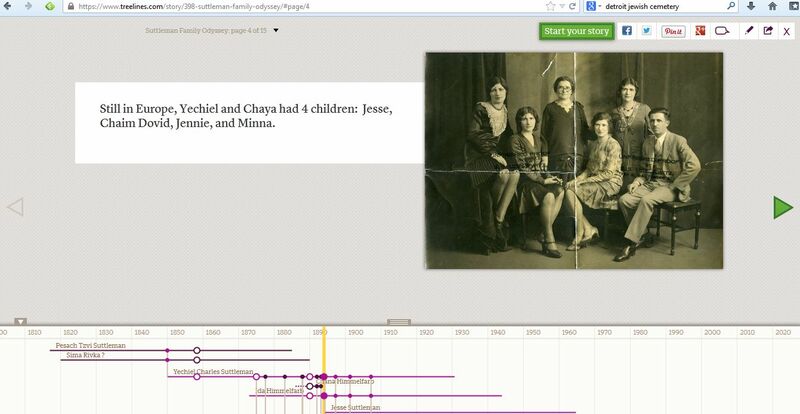 I've been researching my family since I was in high school. In the early 1990s, my mother humored me, driving me to the National Archives to search for census records and boat manifests on microfilm. She also brought me to the local Family History Center where I pored over more microfilm. I spoke to my grandparents and recorded all the names they told me in the MSDOS version of Brodebund's Family Tree Maker. I updated it on and off through the years but didn't really do more research. Then in the summer of 2011, I helped to organize a family reunion. 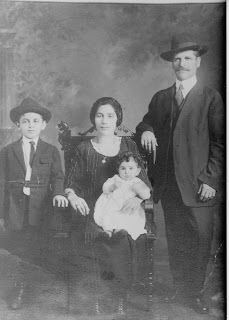 My great-great grandfather Yechiel Suttleman was married three times (including to two sisters) and had twelve children. 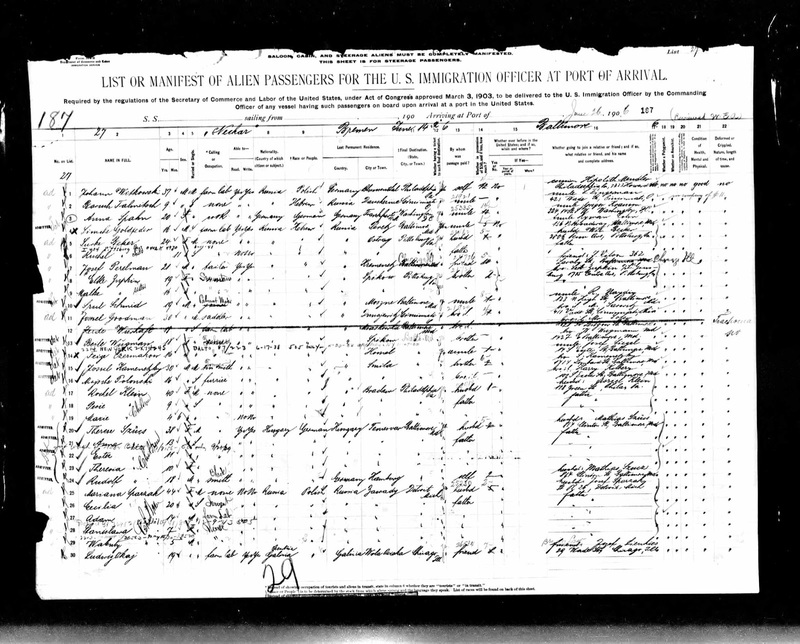 I bought the new Family Tree Maker (and unbelievably it was able to take my decades' old file) and started exploring with the free subscription to Ancestry.com. And in 5 minutes I found all the documents that I'd spent weeks looking for on microfilm, including some I'd searched for but never found.